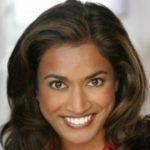 Media insider Roshini Rajkumar is a talk show host and media commentator who seeks to uncover the WOW! in icons and newsmakers. A few memorable interviews include Patti LaBelle, Arianna Huffington, Garth Brooks, Madeleine Albright, Gretchen Carlson, and Alan Page a day after news broke he was to receive the Presidential Medal of Freedom. When she’s not on the air, Roshini is an executive coach and mainstage speaker, who teaches her Own Your WOW!™ method to leaders around the United States. In 2019, she celebrates 13 years as a business owner. She draws on more than thirty years of public speaking, her former career as a television reporter, and her status as a licensed attorney to guide clients through engineering their personal brands and winning performances in high-stakes settings. Her book, Communicate That!, is in its third edition and has been read by thousands of people in the United States, Canada, and Asia. You can also find her articles in Artful Living Magazine, MD News, and Attorney at Law. Roshini is a regular contributor for Breaking the News on KARE-TV, Twin Cities Live on KSTP-TV, and Business for Breakfast on KDMT in Denver. She is frequently asked by media around the country to share analysis about brand dynamics, leadership, and crisis communication.